International House is an enriching transformative experience for our residents and Alumni. Your contributions go a long way in ensuring that this rich community continues to grow and thrive. Thank you for your interest in supporting International House. Your philanthropy plays an essential part in our ability to provide a home for the next generation of global leaders. Online giving is secure and easy to use. We accept MasterCard, Visa, Discover, and American Express. Your gift to International House may be tax-deductible. We are an exempt organization as described in Section 501(c)(3) of the United States Internal Revenue Code. Become a monthly donor to International House and set a recurring gift. Giving the gift of securities is simple and tax efficient. Funds can also be wired directly and safely from your account to International House. The Harry Edmonds Society recognizes those who have provided for International House in their estate planning. International House has affinity groups in Canada, Germany, and the United Kingdom who organize activities for Alumni and offer tax-exempt giving for some individuals living abroad. International House offers meaningful opportunities for corporate sponsorship including scholarships, named series and leadership programs. International House provides several ways for you to direct your gift based on your interests and philanthropic priorities. We open the I-House doors to alumni and friends for concerts, lectures, discussions and performances by our residents. Each year we host the International House Awards Gala in the Spring. Many employers will match contributions made to I-House by their employees. Your employer’s human resources office will be able to provide necessary information on the company's matching gift policies. 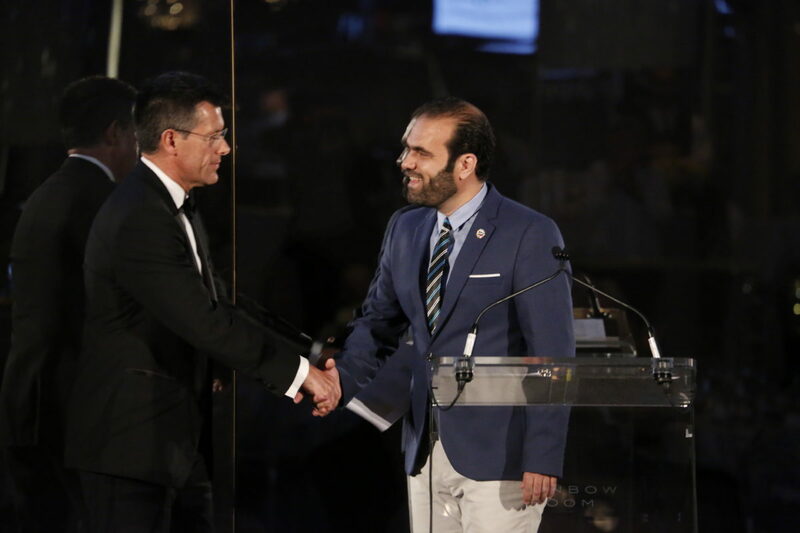 On Wednesday, May 23rd, 2018, International House hosted its Annual Gala at the Rainbow Room in Rockefeller Center in New York, bringing together honorees, trustees, donors, Alumni and Residents. During the event, four renowned leaders were honored for their contributions in advancing the International House mission. Your gift will enrich the life of extraordinary young women and men from all corners of the word. Thanks to you, our residents will forge special friendships, gain a deep appreciation of other cultures, and build qualities of leadership, tolerance, and respect that will last a lifetime. International House is grateful to the following donors for their contributions in our 2017 Fiscal Year (gifts received between July 1, 2016 and June 30, 2017). An I-House Alumni Membership offers a wonderful opportunity to stay connected and continue benefitting from inside access to the House in addition access to events and select programs.